The Climate Stories Collaborative invites members of our campus and community to a showcase of creative works produced by students in classes across the university. This exhibition and related events will feature visual and performance pieces expressing climate stories—stories of those who are affected by and/or taking action to address climate change. Join us and experience student reflections on climate change in a variety of creative media—painting, sculpture, theatrical performance, videography, photography, design, narrative non-fiction, poetry, and more—at the College of Fine and Applied Art's HOW Space venue downtown. 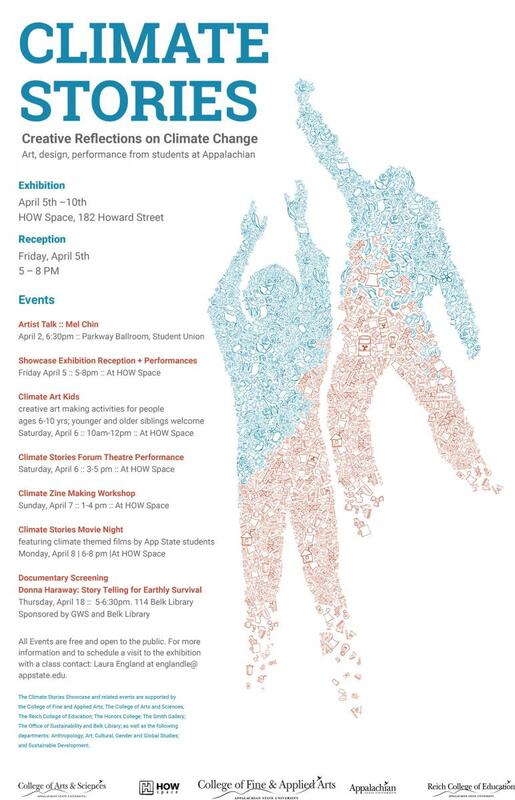 This event series is hosted by the Climate Stories Collaborative, with support from the College of Fine and Applied Arts; The College of Arts and Sciences; The Reich College of Education; The Hayes School of Music; The Honors College; and The Smith Gallery. With participation from students in: Anthropology; Applied Design; Art; Communication; Cultural, Gender and Global Studies; Curriculum and Instruction; English; Geological and Environmental Sciences; Government and Justice Studies; Management; Mathematical Sciences; Social Work; Sustainable Development; Sustainable Technology and the Built Environment; Theatre & Dance; and University College. All events are free and open to the public, and will take place at HOW Space unless otherwise noted. Saturday, April 6 | 3-5 p.m.
Sunday, April 7 | 1-4 p.m.
Monday, April 8 | 6-8 p.m.
For more information or to schedule a class visit to the exhibition April 8-10, contact Laura England at englandle@appstate.edu.